Nine alleged militants were killed this morning during a special drive of the joint forces in Dhaka’s Kalyanpur area that began with a raid to hunt down militant den. SWAT, Rapid Action Battalion (Rab), Detective Branch of police and Dhaka Metropolitan Police (DMP) jointly carried out one-hour operation “Storm 26” from 5:51am. “We neutralised nine militants in the operation,” Sheikh Maruf Hassan, DMP additional commissioner, told media on completion of the operation,reports The Daily Star. One of the militants was detained from the spot with bullet injuries and was taken to Dhaka Medical College Hospital. He claimed to be a member of the Islamic State, DMCH police camp sources said. 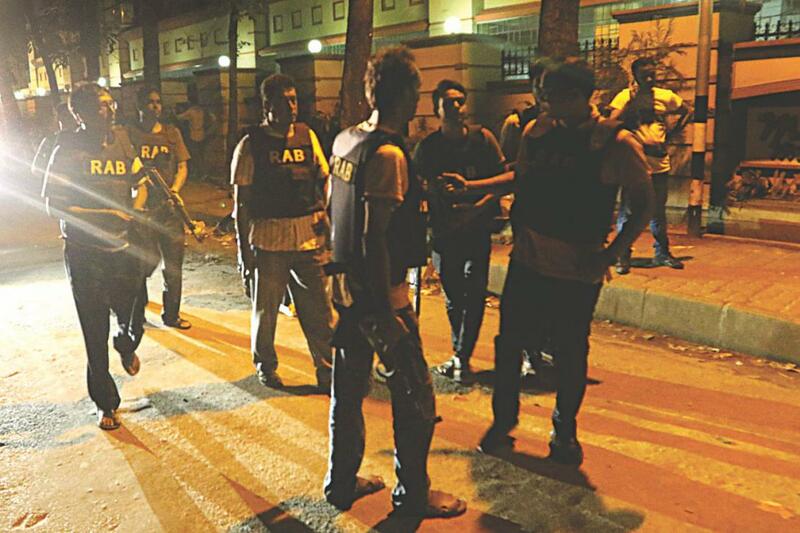 Earlier on July 1, gunmen, allegedly belonging to the faith of Islamic State, killed 20 hostages, mostly foreign nationals, at an upscale eatery Holey Aritisan Bakery in Dhaka’s diplomatic zone in a 12-hour-long siege. Police believes the Gulshan restaurant attack and the attack on Sholakia Eidgah on Eid day were both carried out by JMB militants who were trying to wield the emblem of the Islamic State. Mirpur police and elite force Rab carried out the primary crackdown in the multi-storied “Jahaj Building” at Road no. 5 in Kalyanpur around 12:45am, our correspondent reports from the spot. The militants said to have hurled handmade bombs at the law enforcers, who, in retaliation fired several rounds. Overnight, the occupants of the buildings and adjacent ones were evacuated. “We took time to evacuate the residents,” Additional Commissioner Maruf Hassan said. An ambulance of Bangladesh Fire Service and Civil Defence seen at Road no 5 in Kalyanpur of Dhaka where joint forces conducted a special anti-militancy drive on July 26, 2016. The militants were holed up in the fifth floor of the building. Police said they had rented the flat and were living there. Operation “Storm 26” began at 5:51am. Several hundred bullets were heard to have been fired during the one-hour operation. Nine alleged militants were said to have been killed at the spot. Last reported, police had cordoned the area and going through the building. A team of bomb-neutralising squad was seen among the team. The alleged militant who was held bullet-wounded from the scene was identified as Hassan, hailing from Bogra. He claimed he was the cook of the militants of “Jahaj Building”. He had a bullet injury and a fractured left leg, Sentu Chandra Das, an assistant sub-inspector at Dhaka Medical College Hospital’s police camp, told The Daily Star. He told doctors that he along with ten others live in the fourth floor of the building from where he jumped off sensing police presence. Inside the flat, there were heavy arms and explosives, he said.